Missouri girl fighting cancer dresses as herself for "Superhero Day"
Josie may not be your typical "superhero," but similar to comic book legends -- she does have a big battle to fight: cancer. Last week, the 4-year-old Kelso, Missouri, resident was struggling to pick out a costume for "Superhero Day" at school. What she didn't realize -- she had the costume all along. As kids dressed up as Superman, Batman or Spider-Man, the little girl draped a cape over her shoulders and called herself "Super Josie." Her slogan: "Destroying cancer one day at a time." The cape was given to her by a "super woman" who worked at Cardinal Glennon Children's Hospital, where she spent months fighting acute lymphoblastic leukemia. Josie, who was diagnosed with leukemia at age 2, is now in remission. But that doesn't mean the fight is over. Young cancer patients have to do at least three years of chemotherapy, Josie's mom, Alyssa Butler, explained to CBS News. To make sure she doesn't relapse, she has to continue to have blood drawn, get spinal taps and go to the doctor for daily checkups. Despite her difficult journey into life, the blonde-haired, blue-eyed girl still has a great big grin on her face. "She's a superhero to me," Butler told CBS News. "She's something -- she's really outgoing, she's not scared of anything in this world I don't think." 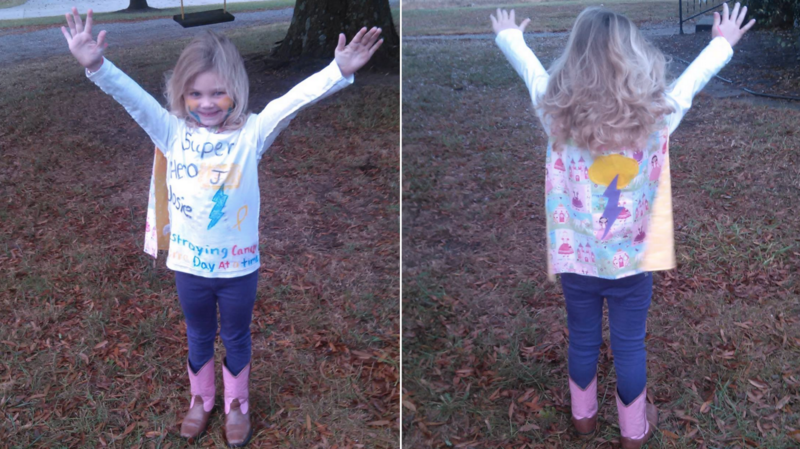 So, Butler designed a superhero emblem, tied a cape around her daughter's neck and created a "Super Josie" costume. "She fell in love with it," Butler said, describing how Josie lit up and took off "flying" shortly after putting it on. The next day, Josie couldn't wait to show off her costume to her pre-school classmates. And when she returned home from school, she didn't want to take it off. "She went to bed wearing that cape," Butler laughed. As Josie's story continues to go viral, Butler hopes other cancer patients will find inspiration: "For the kids that do have cancer -- I hope they see that they can be their own superhero -- see how strong they are and what they're capable of."